Quick drying water based paint. Contains textured agents to improve the slip resistance in wet and dry conditions. For interior and exterior use on tiles, concrete and bricks. Rated as “low slip risk potential” according to BS7976, Part 2, 2002; Assessment of slip resistance in wet and dry conditions. 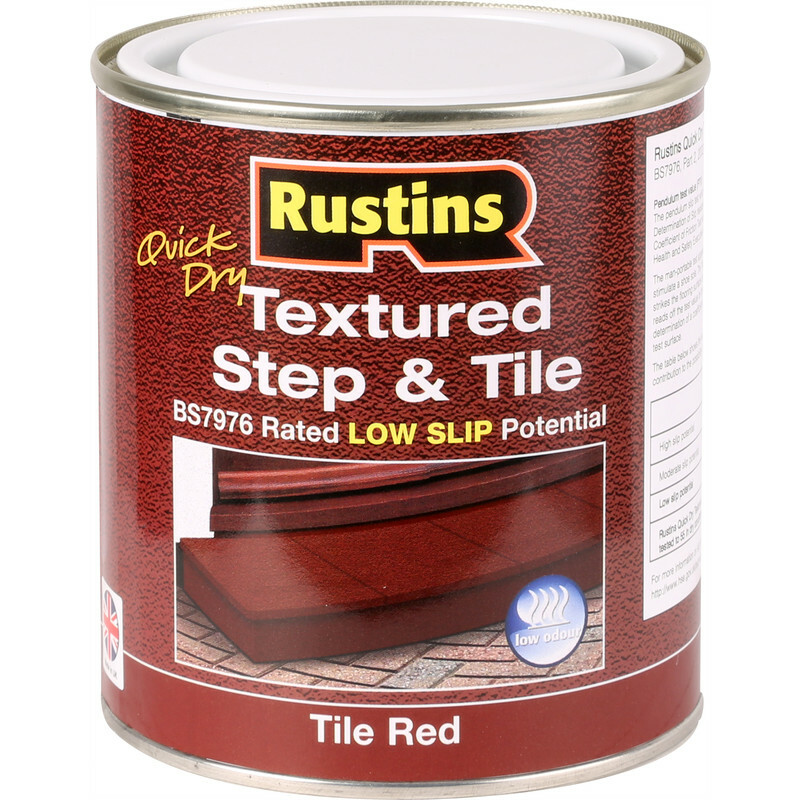 Rustins Quick Dry Textured Step & Tile Paint 500ml Red is rated 3.8 out of 5 by 10. Rated 4 out of 5 by Ian at Manchester from Did it’s job It did its job. It didn’t didn’t cover as far as I was expecting but that is probably due to the fact that a proportion of the paint is a very fine grit additive enabling the non slip finish. It’s important to give the paint a good stir before use as there was a lot of separation between the paint and the grit. I would use this product again. Rated 4 out of 5 by Irene A from Final finish pleasing I bought this product to freshen door step. First coat went on as strange colour, but second coat a rich bright red. Rated 2 out of 5 by Sayitasitis from Poor Didn't cover well, old stock had settled in tin, needed to keep stirring dried patchy. Only advantage was quick drying so managed to get the 4 coats necessary on in a day. Rated 5 out of 5 by Patsy77 from Good product Does exactly what it says on the tin. Rated 1 out of 5 by monroe man from terrible Opened the tin to find the paint had crusted on top.Give it a good stir it says on the tin. Stirred for 10 mins looked a bit better so tried to apply. It came out more brown than red. Found that the red pigment had settled on the bottom of the tin and no matter how i tried it would not mix. Bought another make locally which was perfect and cheaper.